Ford is recalling certain F-150 pickups due to a fire risk. Ford is issuing a safety recall for select F-150 and Super Duty trucks equipped with engine block heaters that had been inspected in accordance with a previous recall. The half-tons encompass model years 2015 – 2019 inclusive and the Super Duty pickups are 2017 – 2019 models. In vehicles which were brought in for the other inspection, the engine block heater cable splice connectors may have inadvertently become damaged during that service procedure. In other words, the company is essentially issuing a recall on their recall. A damaged block heater cable can cause an inoperative engine block heater, tripping of an electrical breaker, or a resistive short. The company is concerned about the increased risk of overheated or melted wiring and fire while the vehicle is parked and the block heater is plugged into the mains. Ford is careful to note a safety risk only exists while the truck is parked and the block heater cable is plugged into an electrical outlet. Customers are advised to not use the engine block heater cable. The affected vehicles are a subset of the 874,000 vehicles previously recalled in the previous recall, numbered 18S45. It includes about 327,000 vehicles in North America, with roughly 131,068 of the rigs residing in the States and 196,269 in Canada. Ford is aware of one fire in America and one in Canada that may relate to block heater usage following successful completion of recall 18S45. Ford says they’renot aware of any reports of accident or injury related to this issue. 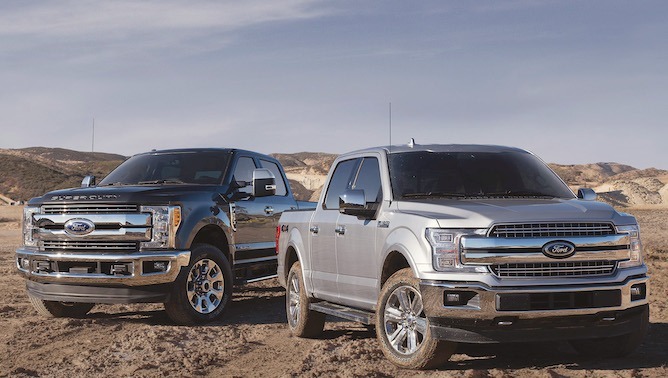 Affected vehicles include 2015-19 Ford F-150s built at the Dearborn Truck Plant between March 18, 2014 and Nov. 17, 2018. This is in addition to F-150s constructed at the Kansas City Assembly Plant between Aug. 21, 2014 and Nov. 17, 2018. Timelines for Super Duty trucks is slightly different, with 2017-19 Super Dutys built at Ohio Assembly Plant between Feb. 5, 2016 and Nov. 17, 2018 being affected. Also tangled up in this recall are Super Duty trucks from the Kentucky Truck Plant between the dates of Oct. 8, 2015 and Nov. 17, 2018. It’s interesting that they all have the same stop date, perhaps reflecting a change in supplier or line build procedure.